CSEE Professor Anupam Joshi has been named an IEEE Fellow, recognized for his for contributions to security, privacy and data management in mobile and pervasive systems. This designation is conferred by the IEEE Board of Directors on individuals with an outstanding record of accomplishments in any of the IEEE fields of interest and is recognized by the technical community as a prestigious honor and an important career achievement. No more than 0.1% of the total IEEE voting membership can be selected in a year. 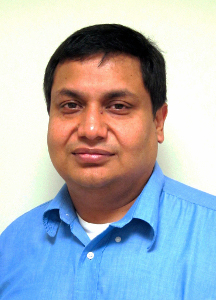 Dr. Joshi joined UMBC’s faculty in 1998 and currently is the Director of the UMBC Center for Cybersecurity. He previousy held faculty appointments at the University of Missouri, Columbia and Purdue University. He received a Ph.D. in Computer Science from Purdue University and a B. Tech in Electrical Engineering from the Indian Institute of Technology, Delhi. While at UMBC he has taught both undergraduate and graduate courses in operating systems, mobile computing and security. He developed and teaches an Honors College seminar on “Privacy and Security in a Mobile social world”. He has mentored nine Ph.D. graduates and a large number of M.S. students. Joshi has made many contributions to the design, analysis and development of intelligent systems for mobile, social and secure computing. Twenty years ago he was one of a handful of researchers who recognized that mobility introduced new challenges for data management, security and privacy over and above those brought about by wireless connectivity. His key insight was to model mobile and pervasive systems as distributed systems that are both open, in that they do not pre-identify a set of known participants, and dynamic, in that the participants change regularly. He observe that applications on mobile devices require greater degrees of decision making and autonomy as they become increasingly sophisticated and intelligent and can’t always assume connectivity to central servers. Entities in these pervasive computing systems must exchange information about the data and services offered and sought and their associated security and privacy policies, negotiate for information and resource sharing, be aware of their context, and monitor for and report on suspicious or anomalous behavior. Dr. Joshi has addressed these challenges across the stack, from network protocols to data management to policy controlled interactions between autonomous entities. Much of his research has been done in collaboration with colleagues in industry such as IBM, Microsoft, Northrop Grumman and Qualcomm. It has been funded by not just them, but also NSF, DARPA, AFOSR, ARL, NIST and other federal agencies. Joshi has published prolifically with more than 200 publications in refereed journals and conferences, many of which are highly cited. He has served as the General or Program Chair of many key conferences including the IEEE International Conference on Intelligence and Security Informatics which will be held in Baltimore in May 2015. The IEEE is the world’s leading professional association for advancing technology for humanity. Through its 400,000 members in 160 countries, it is a leading authority on a wide variety of areas ranging from aerospace systems, computers and telecommunications to biomedical engineering, electric power and consumer electronics. Dedicated to the advancement of technology, the IEEE publishes 30 percent of the world’s literature in the electrical and electronics engineering and computer science fields, and has developed more than 900 active industry standards.